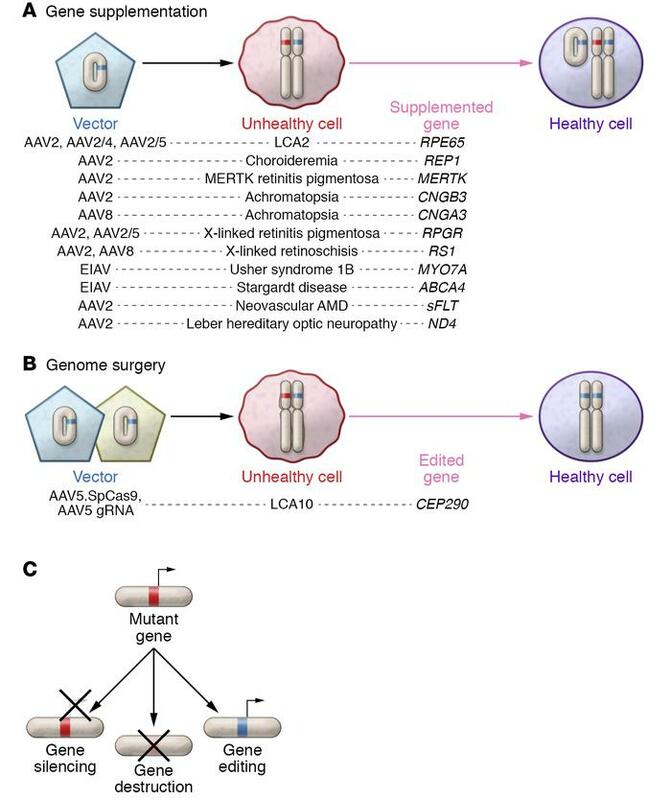 Examples of gene supplementation versus genome surgery in the retina. Conventional gene supplementation works well for mutations that are inherited in an autosomal recessive manner; however, dominant-negative conditions require elimination or repression of the mutant allele to correct the disease phenotype and are unlikely to be ameliorated by supplementation. (A) Schematic of gene supplementation as well as vectors that have been used to treat retinal diseases in current or planned clinical trials. (B) Schematic of genome surgery. For dominant-negative conditions, scientists have focused on genetic tools to modulate gene expression, such as RNAi, or tools that modify the patient’s genome to mutate the pathogenic allele, such as site-specific nucleases like CRISPR-Cas. (C) Description of different approaches used to affect gene expression.